The LM317 is an inexpensive solution to simple variable power supplies. I have several surplus laptop power supplies often rated at 19V at several amps. 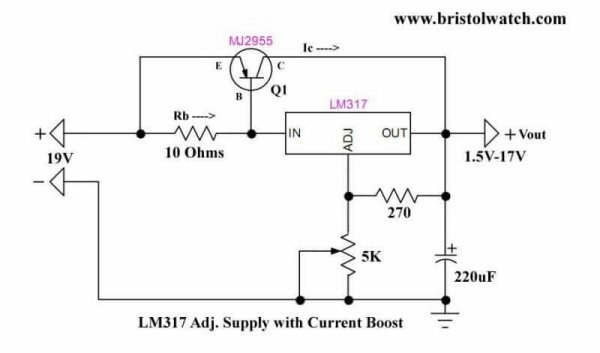 The LM317 has a low current rating that limits its use. This is the simple solution. In Fig. 1 I have a LM317 combined with a MJ2955 PNP pass transistor. As rated at an "excess" of 1.5 amps. By 0.5 amps the device is getting hot. The above test circuit supplied 1 amp while 95% of current passed through Q1. The voltage control properties of the LM317 was normal. The control of the output voltage remained the same. A 10-Ohm resistor across Q1 base-emitter junction is key to current control. Let us take a closer look. Refer to Fig. 2. Suppose the circuit is set for 10-volts and a current of 50mA. Rb current passing through the 10-Ohm resistor produces a voltage drop of 0.5V. This is not enough to turn on Q1 while the LM317 supplies the load current. The heat sink on the LM317 is warm. Refer to Fig. 3. The output voltage is still 10-volts, but the supply current I is 1 amp. The 10-Ohm resistor Rb drops 0.7 volts turning on Q1. Most of the supply current flows though Q1 emitter-collector circuit. Most of the current though Rb flow through Q1 base-collector circuit. 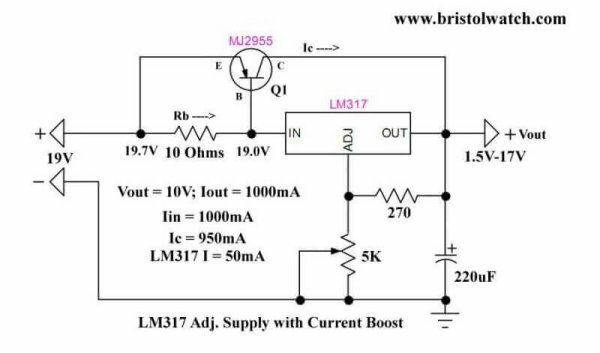 About LM317 supplies 50mA while Q1 supplies 950mA. The LM317 heat sink is warm while Q1 heat sink get warm. One can change the value of Rb to change the turn-on point of Q1. The more current needed by the load the more Q1 conducts. The excess current bypasses the LM317.